Proposed investments in the two major subway lines have similar dollar values, but vary by category because each line is at a different point in its rejuvenation. The table above does not include infrastructure that would be provided as part of planned expansions such as additional trains for Scarborough and North Yonge, as well as a new Northern Yard on the Richmond Hill extension. More trains are also required so that service can be increased on both lines from the current 2’20” the signal system allows to 1’40” on YUS and 2’00” on BD. It is not clear whether some of these costs are actually buried in “capacity expansion”, but the fleet plan charts below clearly show a growth in total fleet size for both lines. Plans for YUS show a bump in service requirements in 2020 that is not matched by an increase in the fleet. The changes every four years in service needs corresponds to a gradual reductions in headway thanks to automatic train control (ATC). For several years, this eats into the spare pool for the route, and the service:spares balance is only briefly restored in 2026. The TTC clearly expects to get good performance out of its Toronto Rocket (TR) fleet and operate with less than their desired spare ratio for an extended period. The next big jump both in fleet size and yard capacity occurs in 2031 presumably as an offshoot of the Richmond Hill extension together with achievement of the 1’40” target headway for ATC. The proposed yard location at the north end of the line means that construction of the extension would have to be substantially complete for its capacity to be available. This could bring problems for the timing of new train deliveries in anticipation of the line’s opening to passengers. In total, the TTC plans to acquire 44 more trains for Line 1 in two groups between 2024-28 and 2030-33. On the BD line, there is a small increase in the number of trains in service, but no actual change in “service needs”. This implies a reduction in the spare ratio with no change in the actual level of service. The spare pool today on Line 2 is larger than the 20% target. The storage problems on BD arose from shifting all of the T-1 trainsets to that line from YUS and Sheppard. Earlier fleet plans assumed that some T-1s would remain on Line 1, but this was rejected in favour of buying a complete TR fleet with automatic train control built in. The TTC owns more T-1 trains than it actually requires and there is a generous spare pool of 16 trains above the 45 required for scheduled service. The excess would provide at least some of the trains required for the Scarborough extension provided that the question of automatic control is addressed. By 2025 the fleet starts to expand, and the timing implies that there would be a combined order for new trains for both lines (Line 1’s fleet starts to expand in 2024). 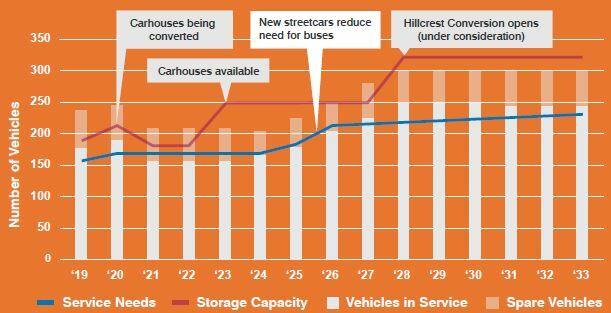 The storage capacity line on the chart (green) sits firmly at about 70 trains until 2030. However, almost all available storage today on Line 2 is now spoken for with the reactivation of Keele Yard and some track usage changes at Greenwood. The only remaining addition is space for a few trains at Kipling Station. Moreover, if “TR” type trains are ordered for Line 2, they cannot be serviced at Greenwood because they will not fit in the carhouse. This makes the timing of a new yard at Kipling much more pressing than the plan indicates. There is no increase in service planned on Line 2 until 2026 (the SSE opening), and even that only covers the extension, not more frequent service, because the ATC project for the main part of the BD line will not be completed by the mid-2020s. 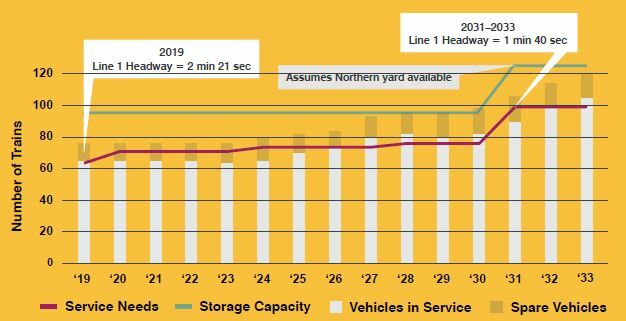 The chart below implies a considerable amount of excess capacity due to the yard at Kipling. However, this does not take into account the need for a new, modern facility to service TR train sets on the BD line, nor the use of Greenwood as the carhouse for the Relief Line which is now has a target opening date of 2029 before the new yard at Kipling would be available according to this plan. Moreover, the plan contains no money for renovations at Greenwood, and this presumably would be built into the Relief Line’s budget. In any event, it has to occur before the Relief Line trains arrive. Missing from the report is a detailed chronology of the changes planned for all lines including extensions, and the dependencies between various projects. There is a considerable history of poorly co-ordinated fleet and facilities planning at the TTC going back over a decade, and these plans continue some of the basic flaws in the timing and sequencing. For budgetary purposes, projects like the Western Yard at Kipling (for which property acquisition is now in progress) get pushed off into the distant future even though the capacity will be needed as soon as new trains begin to arrive for the BD line. There are two major components to plans for stations: replacement of major systems that are at end of life (e.g. escalators, elevators) and capacity expansion for additional demand. The TTC operates Canada’s largest fleet of escalators, and this continues to grow with new stations that are more generously provisioned both for accessibility and for their greater depth. Many escalators on the older parts of the system will be due for replacement or major overhaul during the 2019-2033 period. A major issue for any escalator project is the loss of capacity for passengers between platforms and the surface. Several stations still have only single exits, and it is unclear whether this will change before capacity is lost to escalator renewals. College is a particular example where only one narrow stairway connects the platform to the mezzanine level in each direction when the escalator is out of service. Although the plan acknowledges the need for more capacity, there are few details on where and when this would be provided. There is no explicit item for station capacity expansion other than at Bloor-Yonge in the budgetary figures. The Bloor-Yonge project would involve building a second platform at the lower level of the station for use by eastbound passengers somewhat like the new platform at Union for Yonge line passengers. This would trigger an expansion of the mezzanines connecting with the upper level to provide for vertical circulation and a better distribution of traffic through the station. However, the western end of the station structure is physically within buildings on the north side of Bloor Street, the level of Yonge Station is deeper than at Union, and there is a high water table. This will not be a simple project, and it has a price tag of $1.1 billion. Another major station project will be the addition of Platform Edge Doors (“PEDs”). The details and scope of this work are still to be revealed as part of a study now in progress. The overall breakdown of the $3.9 billion for “stations” projects is 27% for Bloor-Yonge Station, 24% for completion of station accessibility by 2025, 6% for escalators and elevators, 32% for PEDs, and 11% for “other”. As with the “subways” plan, this section would benefit from more detail and a chronology cross-referencing major projects with other significant events such as planned increases in the level of service and the opening of extensions that will add to demand. Plans for bus service, the fleet and garages sound nice in theory, but many issues lurk under the surface. Simply maintaining our current fleet size will require purchasing between 120 and 160 buses every year to replace retiring vehicles, but there is currently limited bus funding in 2021 and 2022 and no funding thereafter. Accommodating increased ridership will require an additional 15 buses per year. At the same time, we are determined to transition to zero emissions technology as soon as practical. Purchase 2,300 new low/zero-emissions buses at a total cost of nearly $3.7 billion, representing a complete replacement of our fleet as older buses reach the end of their 13-year useful life. By moving to steady state procurement for new buses — which means buying them in similar quantities every year — we limit sudden spikes in our capital funding needs and increase the efficiency of our maintenance operations. Two recent policy changes have triggered a large increase in future capital needs for the bus fleet. For many decades, the TTC would keep a bus in service for about 18 years, sometimes longer, with two major mid-life overhauls to replace major components such as the diesel engine and bring the body back to “like new” condition. As buses became technically more complex, and as North American bus standards shifted to vehicles with a shorter design life, rebuilding a bus became more challenging and the last third of bus lives saw much lower reliability than with newer buses. In response, the TTC now plans on a 12-13 year replacement cycle for vehicles, and the reduction of the average fleet age has substantially improved bus reliability with a “60% reduction in breakdowns since 2014” [p. 33]. However, this also increases the annual need for new vehicles by 50%. The TTC and City of Toronto have embraced a goal for a zero-emissions fleet by 2040 and to that end will now only purchase low or zero emission vehicles. The last “clean diesel” arrived at the TTC in late 2018. In the near term, they will shift primarily to hybrid diesel-electrics while running trials on fully electric (battery) buses. This adds substantially to vehicle costs, and as the quote above shows, the TTC anticipates a unit cost over $1.5 million per vehicle over the 2019-33 plan. A further expense will be the retrofit of existing garages for an electric fleet, and only a small amount of this work is included in current budgets. The TTC does not expect to remove the last buses from streetcar lines until 2025 because of the timing and likely allocation of new streetcars. The rate of growth of service due to ridership is only 15 buses per year, less than one percent of the service requirements in 2019. The plan shows no effects from the replacement of buses by new subway and LRT service on Eglinton, Finch or in Scarborough. Although there will be two new garages, their primary function is to provide room for the existing fleet which is now shoehorned into overcrowded facilities. Little of the new garage capacity contributes to extra service. In a telling choice of photos, the bus section shows a 97B Yonge bus at Dundas [pp. 32-33] running on a peak-only, half-hourly service that is never heavily loaded. This may be a nice “beauty shot” for a glossy presentation, but it is about as far as possible from being representative. Packed buses on Dufferin or Finch are nowhere to be seen. Unlike plans for the regular bus fleet, Wheel-Trans projects a steady increase of demand over the 15-year period. This will trigger the need for a second garage in the mid 2020s, but will also mean a substantial ongoing increase in the operating subsidy required to operate this service. This is only the fleet for demand handled by the TTC itself, not for rides in accessible taxis. Despite a desire to shift more demand out of Wheel-Trans buses both to taxis and to the “conventional” system, the TTC projects a steady growth in demand for service with its own fleet. The plan for the streetcar fleet shows a substantial increase with 100 more vehicles to arrive in the mid 2020s. If these actually arrive, they will represent a huge increase in fleet capacity compared to the smaller and much less reliable fleets they replaced, and this will allow the streetcar network to “catch up” after two decades where there were no spare cars with which to improve service. Recent experience on 504 King shows what is possible if only service is reliable enough and has room for additional demand. The lack of a comparable approach in the bus network plan is quite telling. The plan for “service needs” appears to be out of sync with other TTC reports and statements about the status of the old fleet. There is a drop from 2020 to 2021 in scheduled service (counted as vehicles), but this mainly represents smaller cars being replaced by the new, larger Flexitys. However, the January 2019 CEO’s Report includes a table showing that the CLRV and ALRV fleets will be retired by the end of 2019, and this is echoed by verbal reports at TTC Board meeting. The fleet buildup does not start until 2024, and this implies that the TTC does not plan to exercise the option for more cars on the Flexity order with Bombardier which could be manufactured as a continuation of current production much sooner. It is not clear whether buses would be used primarily as peak period trippers or if the system would continue with entire routes under bus operation. Although the 15-year plan speaks of the Waterfront LRT extensions opening in a decade or so, there is no explicit reference to fleet requirements. All of the proposed new cars are for ridership growth, not for system expansion. Purchase streetcars on a schedule that uses economies of scale to reduce purchase price per vehicle. This involves completing the current purchase of 204 streetcars, plus approximately 100 additional streetcars from 2025 to 2028 to meet demand, at a cost of $510 million. The proposed Hillcrest conversion, at a projected cost of $900 million, seems rather steep to accommodate considerably fewer vehicles than at Leslie Barns. This scheme needs to be fleshed out with a better explanation of the work involved because the planned expansion of the fleet cannot be accommodated within existing facilities. Originally, the TTC was considering only a small amount of storage at Hillcrest to serve 512 St. Clair, but they have clearly moved to a much more ambitious project as well as a larger target fleet. There are $2.1 billion worth of projects of which the lion’s share is taken by Information Technology, a new Transit Control Centre and other facilities. Although the report does not mention this, the Transit Control would be a second site to back up the existing relatively new one, as well as a backup site for IT facilities. This is not a case of the TTC throwing away almost new assets. Another project in the cards is the consolidation of TTC office space at a site to be determined, although the land around Eglinton Station is often touted as a possible location. This plan is a good start and reveals the depth of problems facing transit service in Toronto, but more work is needed if only to strengthen its arguments. Many project descriptions would benefit from greater line item details including distinctions between projects already in progress and those that have yet to begin. The 15-year plan concentrates on maintenance and rejuvenation of the existing system, but many aspects of the work will interact with planned expansions of subway and streetcar routes. These should be incorporated so that the linkages are clear together with the effects of new services on the existing system. The plan must include more than a shopping list of work to be done. It must also include dependencies and critical timing information to show when decisions must be made and which choices trigger other “must haves”. The timing of projects and related spending should be clearly related to a schedule that will bring new and upgraded facilities and vehicles online when they are needed. This entry was posted in A Grand Plan, Accessibility, Buses, Finance, Streetcars, Subway Cars, Subways, Transit, Vehicles. Bookmark the permalink. Thanks very much for these kinda deepressing details Steve, but your directness and depth of knowledge really really helps. One can only hope that enough political-types read this, and will have enough brains/courage to speak up for public transit means we can overcome such a Large Mess, which today was an acute example of apparently. Steve: One thing that is important to remember here is that the TTC service has no leeway for unexpected loads, and is effectively designed as if every day were a warm, sunshine-filled, birds-singing-in-the-trees spring day. Whenever there is a major storm or any event that drives people who usually drive to work (or even those who cycle) onto the TTC, there is no surplus capacity to absorb them. Stir in the usual operational problems for elderly equipment, errant motorists who don’t know how to drive in bad weather, passengers who fall ill thanks to the crowding, and you have a recipe for exactly what happened today. But if we ran the system with extra room, all we would hear from the budget hawks would that money was “wasted” on transit. So – why are we doing a few extra billion of a subway extension atop a badly extended and at times loaded Danforth line? Especially when, about a decade ago, it seems the TTC was OK with just replacing the SRT, (or was it repairing? ), and having maybe $3B of savings. I imagine that all developers aren’t that stupid to build the SSE (front-page of the Star); but they might have been lined up for existing stations, which may be the motivation for the election-meddling – just to soften it all up for the piratization. And speaking of development, are we not at a point, or past it, where a very serious freeze on development is done until there is actual improvement in transit, not mere plans and talk? Steve: The situation with transit is quite laughable. Queen’s Park proposes to amend the Places to Grow rules to enlarge the area of influence around stations where higher density development is expected. Most of this is likely to occur along the more popular central parts of the subway, not in suburbia. But the subway has no capacity to absorb more riders. If we buy more streetcars, the streetcar system could absorb some traffic, but the new buildings will have to be on the streetcar routes, not out in the suburbs with a vain hope by planners that they might transfer off the subway to a connecting streetcar route at, say, Broadview Station. It is not only that subway assets do not last a 100 years, it is also the horrid lie regarding the other costs creating such of focused capacity in a low density built form creates. The choice to build subway, instead of LRT and BRT, means we require radically longer bus runs, in mixed traffic which means that the number of buses required to support the load is higher than it should be, also the slower longer feeder trips discourage ridership. It’s extremely depressing that we have such a vast sum unfunded just to *maintain the existing system,* nevermind expansion and nevermind that all of these maintenance costs will rise as new line are added (and will be equally unfunded). Beyond depressing. Seems that SOGR isn’t unique to us: Andy Byford went from one system where it wasn’t a priority (Toronto) to another (NYC). Steve said: There is a mythology about transit assets, particularly subways, that they last a century. This is nowhere near the truth, and those who push such claims as a justification for subways as a preferred mode are flat out liars. Only the physical structure lasts many decades, and even that requires ongoing repair. And I’m glad to have that honesty, and at the Dupont station on the Spadina line, I’ve seen lots of vertical fractures in the tilework, and I’m pretty darned sure that indicates something less OK, as almost always, the quality of work done is Good. So there may be yet another lurking issue, and that Dupont Stn is likely subject to a lot of groundwater pressure being at the base of the ‘hill’. Not as important as a few other things, but no shortage of disrepairs. Please note that this is exactly the opposite strategy of the bus fleet, which involves purchasing new vehicles every year. I am certainly not advocating buying no new buses for several years and then replacing the entire bus fleet at once. Imagine the chaos! The bus manufacturer would have to set up a whole new production line, with inevitable quality assurance and teething problems resulting in massive delays. While this was going on, we would be running old buses that were falling apart and incurring huge maintenance costs. This sort of chaos would be… exactly the same as what we are currently going through for the Bombardier streetcar order! In short, I seriously question whether there are any real economies of scale in the current streetcar purchasing strategy. For example, suppose that we were to purchase a fixed number of streetcars every year. Then we would avoid the every-generation-crisis of replacing the entire fleet at once. New technology can be introduced gradually and all the bugs worked out. And if demand increases, we can simply increase our annual streetcar buy instead of our current method of insanely trying to project demand 20-30 years into the future. These claims of economies of scale have a habit of turning out to be imaginary. Right now, we were promised to be enjoying huge savings from the economies of scale of amalgamating Toronto in 1998. Except those economies of scale turned out to be just like streetcar order economies of scale: imaginary. Steve: There is a big difference between buying buses which are in constant production by multiple vendors and streetcars (or subway cars) for which orders are tailored to our system. One could argue that a single gigantic order of streetcars is a bad idea because they will all wear out at once, but we are in this mess because we left replacing the CLRV/ALRV fleets a decade longer than we should have. Ironically, despite a desire to smooth out the bus purchases, the TTC has in fact launched a large purchase thanks to the need to spend PTIF money quickly at the same time as they want to switch to a 12-year replacement cycle and get rid of all their “over the hill” buses without having to further maintain them. We will see the echo of this in a decade or so. Some questions about the TTC’s Capital Investment Plan. 1. What are the two different lines on the charts on page 19 supposed to mean? Steve: I really don’t know, and you may have noticed that I didn’t use those illustrations in my article. This is an example of bad editing because the sample charts are not explained. 2. The plan is to make “… all subway stations accessible by 2025.” Is there any plan for redundancy, particularly at key transfer stations? Right now, I don’t know whether to laugh or cry whenever an elevator is out of order and I read the posted description of the bizarre, convoluted alternate route. Steve: This came up at a TTC Board meeting last year. Management has thought about this, but not in detail because just finishing the first round is challenging in places. Metrolinx is no better and has not built redundancy into their stations on the Crosstown. Moreover, Metrolinx has an attitude that even escalators are a waste of money and people can just use stairs (or queue for a single elevator if they need it) based on a completely different station design (shallow underpasses) and demand pattern (relatively fit commuters who arrive in waves with long gaps between trains). 3. On page 31 we read, “89% of TTC ridership is from within Toronto.” What does this mean? I can think of at least three radically different interpretations of this statement. i) 89% of TTC passengers are residents of Toronto. ii) 89% of TTC passengers are taking a trip whose origin is in Toronto. iii) 89% of TTC passengers are taking a trip whose origin and destination are both in Toronto. Steve: A “ride” that crosses the boundary is really two trips (at least) for statistical purposes, with one counted on each system. Someone who rides YRT to the subway counts as a rider in both systems. The overall numbers are dominated by rides within Toronto. 4. Page 35 contains the capital investment summary for buses. Page 53 contains the capital investment summary for streetcars. I see that replacing worn-out track is included in the streetcar expenses, but repairs to roads due to wear placed on them by buses is not included in the bus expenses. Has this skewed decision-making by making buses appear cheaper than they really are? Steve: ‘Twas ever thus. One interesting point, however, is that with the cost of a standard electric bus going well over $1 million, and the TTC shortening the target lifespan to 12 years, the cost comparison for vehicles is much different than only a few years ago. Based on service design capacities of 50 and 130 respectively, you need 2.6 buses for each streetcar or at least $3 million, and you have to spend that 2.5 times for the bus during the 30 year lifespan of the streetcar. Before anyone jumps on me with a big “but”, yes, the relative cost of electric buses will come down and their longevity may well rise based on experiences with trolley buses. There are also operating and infrastructure costs. Finally, there is a lot more wear on roads from truck traffic than from buses. 5. On page 54 we read about, “…completing the current purchase of 204 streetcars, plus approximately 100 additional streetcars from 2025 to 2028 to meet demand, at a cost of $510 million.” Is this $510 million just for the 100 additional streetcars, or does it include the balance of the 204 streetcar order? Steve: Look at page 84 which has the line item breakdown. There is $370m to complete the current streetcar order, $360m for the originally proposed 60 car add-on, and $150m for an additional 40 cars. 6. Why does a Wheel-Trans bus have a shorter useful life than a conventional bus? See page 60. Steve: Because basically it is a van built to automotive design standards, not a bus built to travel 1 million km in its lifespan. I am confused – I thought that the new streetcars would replace the older cars basically on a 1:1 basis. The 204 cars don’t cover the old fleet exactly (196 + 52 = 248) but there is more load capacity, so I was guessing on longer headways to compensate. What I am driving at is the continued need for buses once the new fleet completes delivery. The main routes should get enough cars for base service, the peak rush service could use some of the spares, or some of the older refurbished CLRV and ALRV units. AODA compliance is required by 2025, so use of these cars is still permitted. Why the push to stop use in 2019? There are several vehicles that have just been rebuilt recently, can they not be used to run tripper services? This would free up bus assets for other routes. Steve: The original plan was not to replace at a 1:1 ratio, but to replace with like capacity. Of course this meant wider headways and no accommodation of latent demand even though the streetcar system was running, at best, at the service level it had two decades ago. The philosophy now is to do 1:1 to the extent possible and this requires more cars. Peak streetcar service today requires about 160 cars, but that does not include Bathurst, Dundas or the Kingston Road services which would require roughly 45 more cars. This would use up the entire 204-car fleet with no spares. Using a 20% spare ratio, the fleet would support a peak service requirement of 170 cars, or about 10 more than current peak service. The CLRV/ALRV fleet is on its last legs and will be retired by the end of 2019. Keeping it alive to 2025 is not in the cards as recent cold-weather problems have shown. On another note, for a zero emission bus fleet, would the TTC ever think to look at trolley buses again? They make some triple length styles, so capacity is there. Steve: I would not hold my breath for trolley buses. It will take the TTC years to get to a stable situation with battery buses and to determine whether there would be inherent advantages of moving to TBs with overhead wire power rather than batteries. The political pressure is to electrify, but TBs would bring a while extra level of infrastructure needs that would delay the process and prevent implementation and testing on a wide variety of routes. Those of us who are already “believers” in trolley buses would say “just do it”, but that’s a harder sell in the political world, probably only slightly easier that trying to build LRT in Scarborough. Do we really need platform edge doors for stations like Chester, Christie, Castle Frank, High Park, Runnymede, Old Mill, Royal York, Jane, Keele, Lansdowne? This is an expensive add on; it should be implemented on the busiest stations only. Do you agree Steve? Steve: PEDs are advocated by TTC management for a variety of reasons that seem to change depending on the then-current problem. There is always the matter of suicides, and the distribution of those around the system is such that doing “only busy stations” won’t deal with the problem. There are people who get down to track level for other reasons, and recently with increasing frequency. There is the problem of garbage blowing onto the tracks and causing fires. Finally, there is the question of safety in busy stations. Out of the total cost, we have to ask what our true goal(s) is/are and how much we are willing to pay to achieve them. As for your station list, I think there are folks along the BD subway who might take issue with some of the stations you list. They may not be Bloor-Yonge, but a lot of them are busy transfer points. Why is the Relief Line supposed to (eventually) terminate up Roncy and at DW Station? Roncy has a streetcar that was upgraded not even a decade ago. Why is there not a push to run the RL near Liberty Village along King and then turn it northward on Dufferin to terminate at the BD or Eglinton line? Steve: The west end of the RL is a fantasy that I doubt we will ever see. Serving Liberty Village will be a challenge with the route choice along Queen Street. You could blame John Tory whose Smart Track scheme demanded that the RL keep its distance from the rail corridor to avoid competition. It does not really matter where a new line turned north. The basic problem is that there is strong local demand at stops along Roncesvalles and Dufferin. A new line would be lucky to have one stop between Queen and Bloor, and would provide far worse service for demand on those streets. Anecdotally regarding trolleybuses: I am familiar with the system in Gdynia, which has around 90-120 vehicles. It has an existing core of overhead wire built in times of classic systems with little-to-no-battery, but new route extensions are now done without lines, and driven on battery. This is partly due to cost of building overhead, but it’s not like capital and operational cost of infrastructure isn’t an issue in Toronto either. Steve: I agree. The lines that are potential TB candidates are not conveniently concentrated where they can share infrastructure. While I am dubious about the wholehearted embrace of battery buses, pending solid industry experience rather than hucksterism from vehicle builders my attitude is “wait and see”. A whole zero-emission fleet, eh? That seems like it will trigger a whole set of infrastructure costs that aren’t even imagined in these reports. Trolley buses or battery buses will require a ton of electrical infrastructure. Then there’s the logistics of charging and the poor cold weather performance of batteries. Even hydrogen buses require a rebuild of fueling infrastructure. Steve: It is one of several critical omissions in the report. Truer words were never spoken. The obsession with “hiding” expenditures and pretending they don’t exist is toxic. The latest caper – trading development rights for “free” stations on the Scarborough boondoggle is a fresh example of the idiocy. If the development rights were actually worth the cost of the stations, then government could sell them in the market and use the money to build the project. There is no material difference between that and what is proposed – except that the private sector would be making a profit (or it wouldn’t invest) which is extra. In addition, the development rights are not worth anywhere near the cost to the “private sector” if it provided the free stations. While a subway has its attractions, there are not nearly enough people who want to live that far out to support numerous 50 storey towers – which is what would be needed. Not to mention the impact on the built form and nimbyism of suburban life. Steve, thanks for the great articles on this topic. What is your opinion on the issue of funding all of this? From your general writing on this blog I get the impression that you believe that the city should raise more revenue. Can it do that in any significant way except raising property taxes? I’m asking because somehow I don’t think that funding all of this just through property taxes is realistic. Is it still the case that Toronto pays more federal and provincial tax than it gets back in services? I remember a figure of about an $11 billion imbalance, but that was years ago. I’m not saying that parity in that sense is possible or even desirable, but I think things like these show that Toronto needs additional tax powers. What do you think the solution might be, should a more reasonable government take up residence in Queen’s Park at some point in the future? Giving the city a slice of the income or sales tax directly? Giving it the power to levy tolls, congestion charges, etc.? Steve: Definitely Queen’s Park and Ottawa have to come to the table with regular, sustained funding. The gas taxes we get from each of them are nice, but nowhere what is needed. Funding the megaprojects makes for great announcements, but doesn’t deal with the existing system’s slow disintegration. 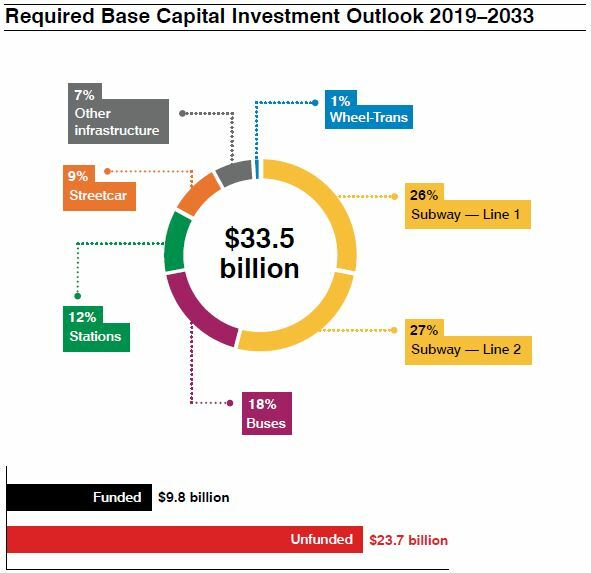 Then of course there is the confusion about the “subway upload” and just how much of that $33.5 billion Ford will take off our hands (and at what hidden cost). Toronto should have additional taxing powers, although I suspect that even if they were granted, they would never actually use them as we have seen from recent history. Everything is painted as a “tax grab” by the irresponsible “tax fighters” of the right, and that view prevails especially among pols who are trying for re-election. Kevin Love: I am certainly not advocating buying no new buses for several years and then replacing the entire bus fleet at once. Imagine the chaos! The bus manufacturer would have to set up a whole new production line, with inevitable quality assurance and teething problems resulting in massive delays. While this was going on, we would be running old buses that were falling apart and incurring huge maintenance costs. This sort of chaos would be… exactly the same as what we are currently going through for the Bombardier streetcar order! No, the chaos will NOT be “exactly the same as what we are going through for the Bombardier streetcar order!”. It will be much worse for several reasons. Firstly, the bus network carries far more passengers than the streetcar network. More importantly, buses have been sent to rescue streetcar passengers time and time again from Bombardier’s incompetence, etc but will streetcars be able to rescue even a single bus passenger if the bus fleet was no longer able to provide any service? The answer is NO. Pardon my being the cynic (beyond the rightful amount most posters are) by is this a form of ‘poison pill’ by the TTC Board against upload by QP? The new-found sense of ‘corporate responsibility’ and the sudden revelation of bunions, corns and acne is just a little curious. That sounds about right. However, do you think that some kind of “tax sharing” would be ever implementable? For example, a law that would give Toronto 10% of the income tax collected from its residents. Then also a % of the corporate taxes…etc. To me this sounds reasonable: rather than having to go begging to QP/Ottawa to get things in Toronto funded from taxes that Torontonians pay, a slice of the taxes is directly redirected to Toronto’s coffers, and the city government figures out what to do with that. It has the advantage of not increasing the total tax burden on people in the city, so the “tax fighters” can’t really complain. Steve: It’s eminently sensible, but will never happen. Any sharing such as you describe would have to be implemented not just for Toronto, but across the province or country, at least in the major cities. Steve wrote: There are also operating and infrastructure costs. Finally, there is a lot more wear on roads from truck traffic than from buses. While I agree that truck traffic contributes more wear on roads than buses, there is one highly visible wear that is unique to buses: bus knuckles at stops. Perhaps the cost of repaving where bus knuckles were present (and usually are not done until they approach hazard condition) should be included in the cost of buses when used to compare with the cost of LRT/streetcars with track infrastructure included. will asked: Do we really need platform edge doors for stations like Chester, Christie, Castle Frank, High Park, Runnymede, Old Mill, Royal York, Jane, Keele, Lansdowne? Finally, there is the question of safety in busy stations. While the issue of safety from overcrowding in a busy station is important, the other aspect of safety applies to every single station, busy or not: the ability to not have to approach stations at a reduced speed. Where there is restricted access to the track from the platform, trains can enter stations at speed and service brake to come to a stop where it needs to. This may seem like a minor thing, but overall it can have a significant effect on performance of the entire line, from faster travel times (if each stop is reduced by 20 seconds, travelling 15 stops is reduced by 5 minutes), to increased capacity (less time to complete the run means the same number of trains take less time to pass the same location, which means more trains per hour). Can someone explain to all levels of circus (sorry, I mean government) that the relief line should be built in one shot all the way to wherever it ends north of the 401? Finish the bloody planning ASAP and put the TBMs in the ground shortly after. Let them dig all the way up to Sheppard or further north. Line 5 will already cause a duplication of the Yonge-Bloor issue at Eglinton once it opens in 2023. Also, why does it take 8 bloody years to finish things? Let’s assume you always need 6-9 months of testing and that will be done supposedly in 2021 or 2022, why is it that it takes 5+ years to build all of the stations once the TBMs completed their mission in summer of 2016? Can’t we build the bloody stations after the TBM has passed through the “station box” wall, rather than wait for all tunnels to be completed to start a process? One could easily shave some good amount of time on the process if they thought that way. Steve: If you think back to the tunneling on Eglinton, you will remember that the tunnel behind the advancing TBM was used to remove the spoil from the ongoing excavation. Until the tunnel is actually complete, station construction cannot break into that structure. In the specific case of Eglinton, the tunnel contract was separate from the stations and this probably added to the total elapsed time. Because there is no need to finish the stations until the surface portion is finished. Just to correct on that Steve and those commenting on this blog, Yes, The legacy high-floor streetcar fleet is on their last legs. It is expected that the ALRVs (double-length ones) will be gone entirely by the end of 2019 since they are the breaking down more often than CLRVs (20 of these were rebuilt and only 10 of these are still alive at the time this comment was posted). As for CLRVs (standard ones) I believe that some of these vehicles will still remain in the fleet for the foreseeable future (probably up until 2021 at this point) to supplement peak hour service on certain routes until there are sufficient number of new Flexity streetcars available. So far (at the time this comment was posted) only 122 of the new Flexity streetcars have been delivered, by the end of 2019, there will be 204 new Flexity streetcars in the fleet providing – at least partial – service on all streetcar routes in the TTC network. Steve: Rick Leary is hoping to retire all of the CLRVs by year-end. See table on page 41 of the January 2019 CEO’s Report. Also we’re a bit past 122 new cars, although a few of them are back at Bombardier for retrofits/repairs. J Graham: What I am driving at is the continued need for buses once the new fleet completes delivery. The main routes should get enough cars for base service, the peak rush service could use some of the spares, or some of the older refurbished CLRV and ALRV units. AODA compliance is required by 2025, so use of these cars is still permitted. Why the push to stop use in 2019? There are several vehicles that have just been rebuilt recently, can they not be used to run tripper services? This would free up bus assets for other routes. Just to follow up, I can tell you that the ALRVs will definitely be retired completely by the end of 2019, as these vehicles are becoming so deteriorated and breaking too often than and are proven to be less reliable than CLRVs (only 10 of the ALRV vehicles remain in the fleet at the time this comment was posted). As for the CLRVs, some of these vehicles are planned to remain in the fleet until 2021 to supplement peak service on some streetcar routes until there are sufficient number of Flexity streetcars available. I know that the CLRV and ALRV fleets have experienced some troubles during an extreme cold snap. The CLRVs were rebuilt and were rebuilt successfully trouble-free. But as I just said, the ALRVs are retiring at the end of 2019, due to reliability issues and that these vehicles were too severe to be remedied. So far the TTC has received about 122 new Flexity streetcars from Bombardier so far, and plans to deliver the remainder of the 204 car order by the end of 2019. Steve: Actually mixing buses with streetcars, especially with the newer vehicles, map not work very well because of the difference in vehicle size. As occasional fill-in trippers, maybe, but not as a substantial part of the service. The “rebuilt” old cars are unreliable, and there is no desire to attempt to operate them through the winter of 2019/2020, let alone beyond then. Current official Flexity allocations are: 504 King (42), 509 Harbourfront (7), 510 Spadina (14) and 512 St. Clair (20) for a total of 83, although the TTC has fielded about 100 during the recent cold snap, and they regularly show up on 501 Queen. CLRV-based schedules (including those on routes now operate with buses) would be: 501 Queen (42), 502/503 Kingston Road (17), 505 Dundas (18), 506 Carlton (44), 511 Bathurst (11) for a total of 132. There are clearly not enough Flexitys to allow a 1:1 replacement of CLRVs. However, a 204-car Flexity fleet would support a scheduled service of 170 cars with 34 spares (20%). The 87 available Flexitys [170 – 83] would replace 132 CLRVs representing some increase in capacity but at a cost of headways about 50% wider than today. The replacement ratio would probably vary from route to route, but we would not gain much room for growth at a cost of less frequent service. Conversely, if CLRVs were replaced on a 1:1 basis, there would be a shortfall of 35 cars for service [132 – 87] requiring a working fleet of at least 50 CLRVs to remain available, including spares. That’s a real stretch. The 60 add-on cars are badly needed, but the TTC is putting them off to the mid-2020s at least in part because of Bombardier’s lousy reputation and the political challenge of getting funding for more streetcars. Hi Steve, will any of the old CLRV/ALRV streetcars (at least one of each) be saved for charters or special events (such as the Beaches easter parades) after they are fully retired from regular passenger service like they did with the Peter Witt and PCC streetcars? Steve: I have no idea. They are very hard to keep running, unlike PCCs or Witts, because of the solid state controls. If they fail, there are no spare parts and you can’t send out to the shop for a replacement. It seems weird that the TTC would go from absolutely forbidding the purchase of new hybrid buses to wanting to buy only hybrid buses in the course of one year. As far as I know, the jury is still out on the benefits of hybrid buses. I find that many TTC bus drivers drive with a lead foot to keep to schedules, so unless the hybrid buses have very large batteries that allow for all-electric acceleration, I worry that the fuel/carbon savings will not be as good as Nova bus has suggested. It might make more sense to use a mix of standard diesel buses with a few electric buses where feasible instead. I guess we’ll see what the numbers are like at the end of the year. As many may have recalled previously, a few years back, the original plan for retiring the TTC’s older legacy high-floor inaccessible streetcars was that as soon as when the first of the newer low-floor accessible Flexity Outlook streetcars began entering service in 2014, the plan was to initially retire the ALRV (the older legacy articulated double-section streetcars) fleet first or shortly thereafter as they were the least reliable streetcars and were plagued with many problems throughout its service life in the network from 2014 to 2015, with the CLRVs (standard streetcars) following suit from 2015 to 2019. Because of Bombardier Flexity Outlook streetcar delivery delays, the TTC decided to refurbish several CLRV/ALRV streetcars. They were planning to refurbish and rebuild 30 CLRVs and 30 ALRVs. Eventually only 20 ALRVs were rebuilt and refurbished and only 10 of these cars remain in the TTC fleet (at the time this comment was posted), because these cars were still unreliable and very severe to be remedied after the rebuilt and refurbishments, the TTC now plans to retire all ALRVs by the end of 2019 when the TTC fulfills the deliveries of all 204 new streetcars from Bombardier. 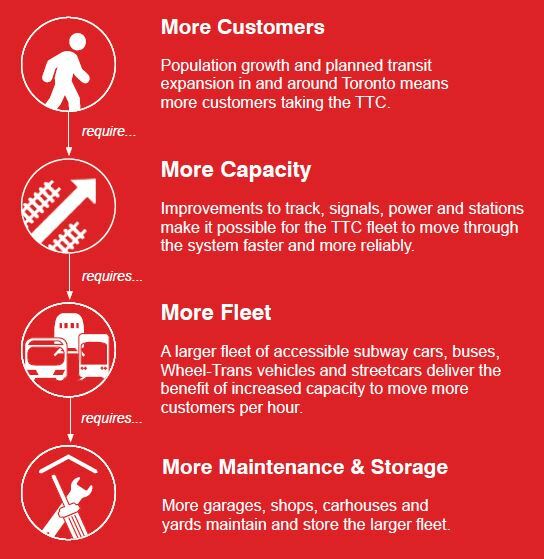 As for CLRVs, some of these vehicles are likely going to stick around for a while longer, probably up until 2021 (as stated in the 2019 TTC Capital Investment Plan report) as the current 204 new streetcar vehicle order still won’t be enough to fully replace the entire legacy old inaccessible streetcar fleet until the TTC can order more additional low-floor streetcars (given that there were 248 vehicles in the entire streetcar fleet to cover all streetcar lines across the TTC network, 196 CLRV and 52 ALRV). While the CLRV streetcars are not accessible, current plans, are for CLRV streetcars to be mixed among low-floor Flexity vehicles and allocated to the busiest streetcar routes, at busier times of the week only, to ensure minimal wait times before a new low-floor streetcar arrives, as it stated previously in the TTC accessibility reports. By law as per AODA standards, all CLRV streetcars will have to be fully retired from revenue passenger service by the end of 2024 at the very latest. Steve: There are conflicting statements from the TTC about the remaining lifespan of the CLRVs. The most recent CEO’s report has all of them gone by the end of 2019 so that TTC does not have to get through another winter trying to keep them running. However, this conflicts with other statements putting their retirement a bit further out. I would believe the CEO’s report because some of the fleet planning info in the Capital PLan (and not just for streetcars) simply does not make sense, and that applies to all modes. This has been an ongoing problem with the official versions of the fleet plans. The same Capital Plan does not show a next batch of streetcars until the mid-2020s, after the requirement for accessibility kicks in. One thing I don’t understand because going by memory I remember the forecasts from last year which included the 60 streetcar option and then the additional 100 in 2025 for a total of 364. Was the TTC being too optimistic at the time? Steve: Two points. First, the add-on would have been more of a sure thing if Bombardier had not been so late on their deliveries to TTC and others. Second, I don’t think it was ever 60+100, but 60+40 to make a total of 100. I was looking through the fleet plan posted here about 3 years ago and LFLRV requirements were projected at 203 in 2019 but that also assumed the continued presence of nearly the entire ALRV fleet that in reality is already effectively retired. If the plan is for an extra 100 in 2026 then that’s a problem. The fleet crunch exists now and it’s severe. Steve: Yup. I will be writing about the problems with all three fleet plans – subway, bus and streetcar – probably next week. I’m waiting for the detailed capital budget books which are due out soon. When the Star reported on the first 67 LFLRV’s needing remedial frame work off property, the PR line delivered by TTC management was that removing 3-4 vehicles at a time from revenue service wasn’t going to affect the service on the street but that clearly is a load of crap. How could it not when they’re so short on vehicles as it is? They would need to hang on to more than 60 CLRV’s beyond this year to meet their requirements in ALRV equivalents but their MDBF numbers have sharply declined to the point where they’re not much more reliable than the ALRV’s. Keeping them around might not be the best idea especially if they end up having to be pulled for weeks at a time next winter. It seems like the only option is tying up 80 buses in actives and spares to bustitute lines but that isn’t an appealing option either as people who need improved bus service in other parts of the city would tell you. This is no way to run a service. During the worst of the cold weather, the TTC fielded 100+ Flexitys out of a fleet of about 120 cars. As I write this [7:20 am, Feb. 21] there are 87 Flexitys on the road with more still to enter service for the peak buildup. Deliveries from Thunder Bay have been at a reasonable rate, although there were some weather-related delays, and we should see another 40 cars by fall 2019. The situation at Kingston is another matter, and we have only two cars from that plant (one in service, one just delivered). Service requirements will be lower than usual through much of 2019 as the water main construction continues to affect Dundas Street, and the large project at King-Queen-Roncesvalles will reduce total needs. The challenge will come in fall 2019 when there should be no construction project requiring bus replacement of streetcars. While the summer construction work is underway, the CLRV/ALRV needs will drop, and this will likely set a “new normal” for what the TTC fields. Building up again could be a problem. Finally, the original plan for the Flexitys was to replace older cars with only a marginal improvement in capacity. However, this has changed in response to latent demand and the experience on King. Queen is expected to receive Flexitys on close to a 1:1 basis for the CLRV service. This means that the 204-car fleet cannot provide all of the peak service if all lines revert to streetcar operation. However, current plans push the next batch of cars off to the mid-2020s rather than as an add-on to the current order. This is partly due to Bombardier’s reputation, and partly a question of deferring a big capital project. CEO Rick Leary says that streetcars will be back on all routes by the end of 2019 and all of the old cars will be retired, but it’s hard to see how he can accomplish this. Hi Steve, During the TTC Leslie Barns fall open house in October 2018, when I asked as to how soon will all of the legacy older streetcars would be retired from regular service one of the staffers there told me that the remaining ALRVs (the TTC’s legacy/older articulated streetcars) would be all retired by the end of 2019 followed by the CLRVs (the regular shorter streetcars) in 2024. See the YouTube video for more. From my understanding the ALRVs are being retired by the end of 2019, because these cars were deteriorating more and less reliable than the CLRVs that the TTC intends to use these only during peak hours. The TTC had planned to overhaul 30 CLRV and 30 ALRV due to the ongoing delivery delays of the new Flexity streetcars, but in the end, only 20 ALRVs were rebuilt due to costs, and as of February 2019, only 10 ALRVs remain in the TTC fleet, these cars are definitely in their final days of revenue passenger service and are expected to be completely retired by the end of 2019, when the TTC finally receives all 204 new Bombardier low-floor streetcars. Enjoy them while you can. According to the TTC’s CEO report in October 2018, it states that by the end of 2019 after the TTC receives all 204 new streetcars from Bombardier, there would only be 25 CLRVs left in the TTC fleet. Steve: The October 2018 CEO’s report states “By December 2019, the total fleet size will be less than 25 CLRVs” [p. 54], and Rick Leary said at a recent TTC Board meeting that they would all be gone by the end of 2019. Also important to note Steve, even when the TTC gets all 204 new streetcars from Bombardier, from my understanding is that TTC bus substitutions will still continue to ply on some routes for the foreseeable future (such as on the 502 Downtowner, 503 Kingston Road, 505 Dundas and 511 Bathurst routes) until 60 to 100 additional new streetcars can be purchased on top of the original 204 streetcar vehicle order. Steve: Yes, I have written a few times about how Rick Leary’s claim that bus substitutions will end this year when all of the new cars arrive does not line up with the number of cars required when one allows for capacity increases on major routes. The original plan was much less generous in that regard. Hi Steve, I have argued many many times with several GTHA transit authorities, Metrolinx and TTC that having TTC surface vehicle drivers handling cash fares can cause distractions and can lead to fare disputes and assaults from some very very violent, angry and irrational passengers, this is why I have made a push to TTC and Metrolinx and several other transit authorities in the GTHA to look into the feasibility of getting rid of all direct cash fares and driver-based cash fare boxes entirely in favor of PRESTO cards in the future (no more coins, no more bills allowed at all on any transit vehicle), this is what I want to see at some point in the future, no cash fares permitted on all TTC buses, all TTC streetcars everywhere, make entire transit system fully POP and PRESTO only, or if you’re caught without a card, there can be a very steep fine, some transit authorities on earth are very strict and do not allow people paying cash to bus drivers, and you have to have a transit card or buy a ticket with cash prior to boarding. The objective of not having cash fares on public transit vehicles is that its much more safer for drivers, safer for passengers, faster, more reliable and more on time. The driver-based cash fare boxes have been around for more than 100 years now, its about time to have the cash boxes removed and replaced by PRESTO readers instead on all public transit vehicles in the GTHA. If you don’t have a PRESTO card, you will have to go to a authorized retail store, or at a subway station to get one. I mean is that they should really add thousands and thousands of retail shops selling LUM paper PRESTO cards and/or standard PRESTO cards. Its time to put an end to all direct cash fares everywhere and I mean all modes, all platforms: all TTC buses, all TTC streetcars and all TTC subway stations system-wide across the TTC network. PRESTO was designed to replace all cash fares, tickets, tokens, transfers and transit passes. I really want cash fares to be removed entirely from all TTC surface vehicles, all buses, all streetcars. system-wide eventually and solely rely on just PRESTO cards (similar to the policy used on some public transport agencies used around the world including London, England or places in Europe). LISTEN TO ME: eliminating all cash fares on public transit vehicles is for the safety of drivers and passengers. Can you bring this to the attention to the TTC board of directors, Toronto City Council, TTC CEO Richard Leary, TTC chair Jaye Robinson and Toronto Mayor John Tory at the next TTC board or Toronto City Council meeting? Steve: Cash fares paid by adults in 2018 amounted to about 8% of all rides, and this percentage has been slowly falling for many years. For seniors and students, it was 15%. There are no cash fares paid to operators on the new streetcars, and of course on the subway they are paid to a collector who is inside a booth. The bigger problem today is with fare inspection and uncooperative/unruly passengers. Moving people to Presto won’t get rid of this as the main issue is fare evasion (that’s why a fare inspector challenges them in the first place). As of the end of January, Presto account for 77% of all fares paid on the TTC and this is expected to grow through the year particularly when tickets and tokens are eliminated. Your diatribe is wildly off the mark.